I realize that Christmas was yesterday so this post is a few days late for this year and several months too early for next Christmas but I still wanted to post a couple of ideas I used this year. I didn't actually use them for stocking stuffers, I put them in the kids Christmas bags that I wrote about in my last post. They would work for any time you need a small gift, the little purses would be cute as a gift for a little girl and the chapstick holder is convenient for keeping track of little chapstick tubes, at least that was my hope when I made it, we'll see how it works out. Every year my husband's family has their big family Christmas party. At the party we do Christmas bags for the kids. We have fabric bags for each of the kids that we fill with little, inexpensive toys and candy, stocking stuffer type stuff. We usually find some little $1 toys for each of the kids and I try to make a few things. Most years each of our kids get a new hat in their bags because that is something that I can make easily and inexpensively, and it is small enough that it fits well in the bag. Some years I have done all animal or character hats. This year I kind of tried to stay away from that, as you can see from the picture that almost worked but not quite. 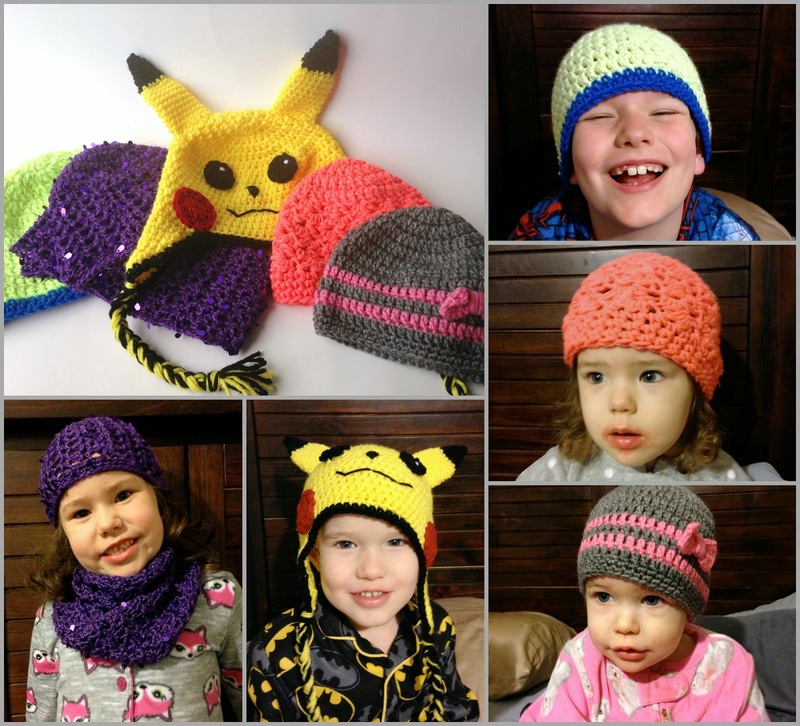 I didn't use patterns for any of the hats, I made all of them up as I went along and have already shared a couple of the patterns. In my last post I mentioned some of the things that I am making for Christmas. One of those was a knit hat and cowl set using a free pattern from Red Heart's website. You can find that pattern here. At the time that I wrote that post I was probably a little over halfway finished with the cowl and had not yet started the beanie. Now they are both finished so I thought I would post about them. I had to be sneaky about taking pictures so that none of my kids saw me with them but I think I managed to do it. I love making gifts for Christmas but I always seem to wait until the end of the year to really start working on things. I feel like I haven't been posting as much as I would like because a lot of the things that I have been working on are Christmas gifts for people in my family so I want to wait until after Christmas to share them. I thought maybe it would be fun to share some links to a few of the things that I am working on and then after Christmas I can share the finished projects. Several of the things I am making are from my own head so I can't link up to those but the ones that I am making using tutorials or patterns that I found online I will. 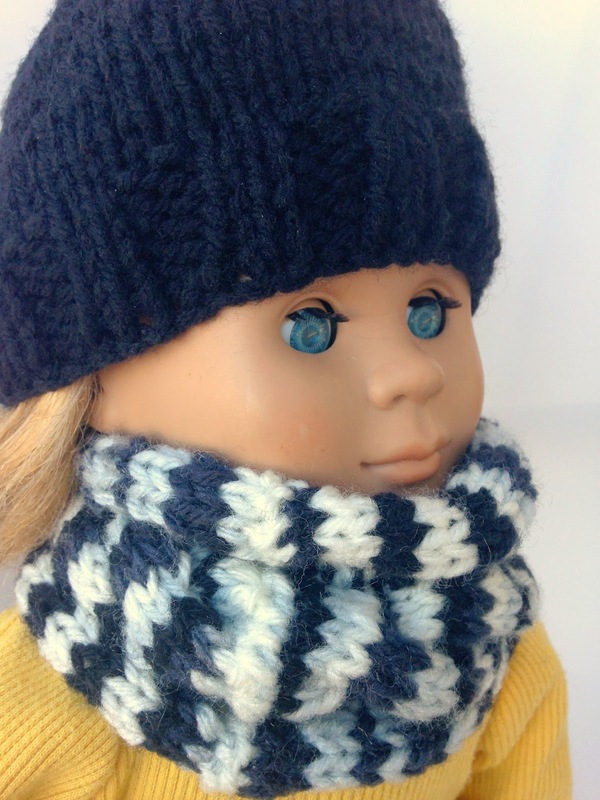 Click on the pictures to find the pattern/tutorial.